Snowguns blasting on the Little Nell run on Aspen Mountain on Wednesday afternoon. Aspen Skiing Co. is assessing whether the chairlifts will spin on Aspen Mountain prior to the scheduled opening Nov. 22. No decision has been made yet, according to Skico Vice President of Communications Jeff Hanle. Skico’s policy has been to open Aspen Mountain early whenever conditions allow and preparations can be made. This year, routine maintenance will be undertaken on the Silver Queen Gondola through Nov. 15, according to Katie Ertl, Skico general manager of mountain operations. “We will open early if we can, but for now we will wait and see,” she said earlier this week. In addition to several waves of natural snowfall in October and so far in November, temperatures have been low enough to make more snow so far this preseason than either of the prior two years, Hanle said. “Snowmaking has been gangbusters,” he said. Several ski areas already have opened in Colorado thanks to bountiful early-season snow. Wolf Creek opened first after a fall blast of snow. Arapahoe Basin and Loveland soon followed. Breckenridge and Keystone opened Wednesday — two days earlier than planned — after getting 4 feet of snow over the prior week. Eldora, which is west of Boulder near Nederland, also opened Wednesday. Ski Cooper outside of Leadville announced it will open Nov. 23 rather than waiting until December, as is usual. As currently scheduled, Winter Park will open Nov. 14; Copper Mountain on Nov. 16; Monarch and Steamboat on Nov. 21; Telluride on Nov. 22; and Silverton will open Nov. 24. 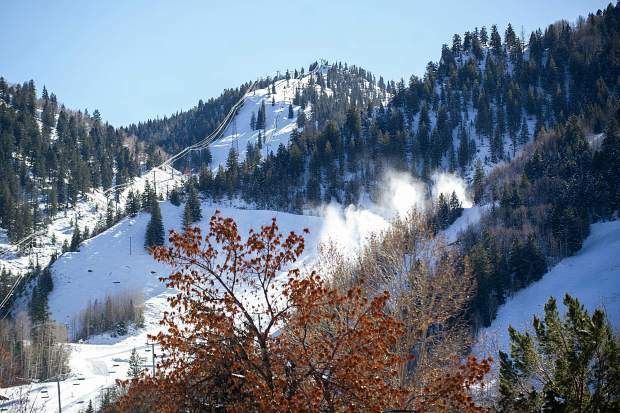 In the Roaring Fork Valley, Aspen Highlands and Buttermilk will open Dec. 8. Sunlight will open Dec. 14.